As mentioned in my previous post I was planning a trip to see my elderly father who lives in Victoria British Columbia. Dad lives in an extended are facility and has dementia. This trip was unlike many that I have gone to see but this one was a little harder since I hadn't seen dad in almost 3 years and I knew what to expect but this time was a little different. 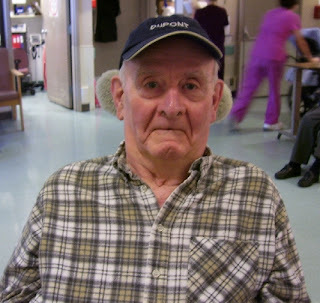 At no time did Dad call me by my nickname or my name, he did a lot of smiling and sometimes depending on where his mind was at he even looked scared or agitated. I saw days of happiness, days of frustration and the day I arrived it was like I wasn't even there. This disease is aweful, you always hear about other families that have a family member who had or has it but when it hits home it sure takes you aback. Makes one think about how you live your life and how you treat others and how you would like to be treated especially in those elderly years. I can say that my Dad is well looked after and well loved by his health care team. He is shaven every day, clean clothes and the nurses just love him. Often I heard that " he is my favourite" . That being said I know in my heart even tho there is a lot of distance between us that is he in the best place possible with people who are knowledgeable about Dementia and Dad is living with the utmost of dignity. It was a very busy kind of trip, not really a holiday although I did seem to find a morning to head on down to Chinatown. I love Chinatown but over the years the stores have changed a lot but the one alley way was still there and held some special little shops that I like to wander in. Fan Tan alley is what I am talking about and here you will see this long alley way and the first door I came to although I am not sure it was even a shop but I didn't recall it being there before I just had to take a pic. 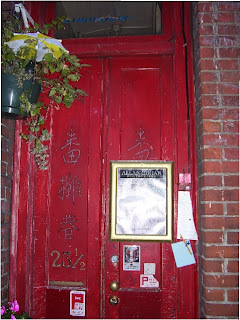 This red door with Chinese characters carved into it screamed at me to take a picture of. 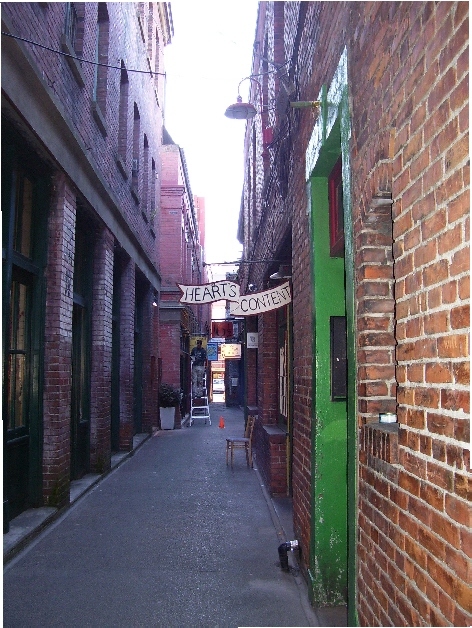 I am not photographer and I tried my best to get it all in, the alley wasn't very wide so I couldn't really stand back and get it from top to bottom. Anyways I did find some rice paper napkins to play with in my artwork for ATC's and cardmaking and some neat Chinese papers with floral designs. It didn't say use for Oragami but I am sure that is probably what it is for. 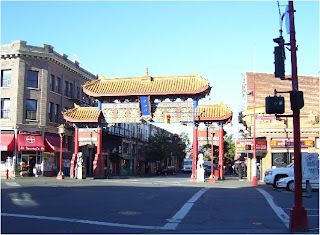 Gateway to Chinatown (above pic) I was there early, I guess most shops don't open til almost 10 and I was there around 9. 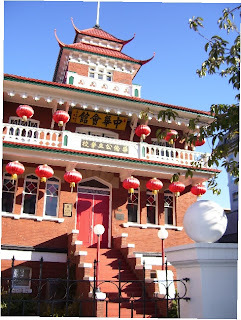 Chinese School, years ago I was in this school and not sure it is still in use but don't you just love those lanterns? 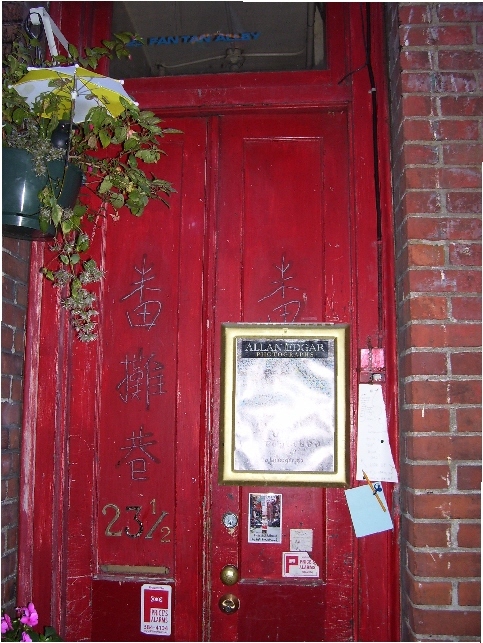 The Red Door, click on the pic for a larger view to see those Chinese Characters carved into it. Not sure what all the notes and things hanging on it but I am sure it was for some reason. Made it look kind of junky but oh well, loved the door just the same. 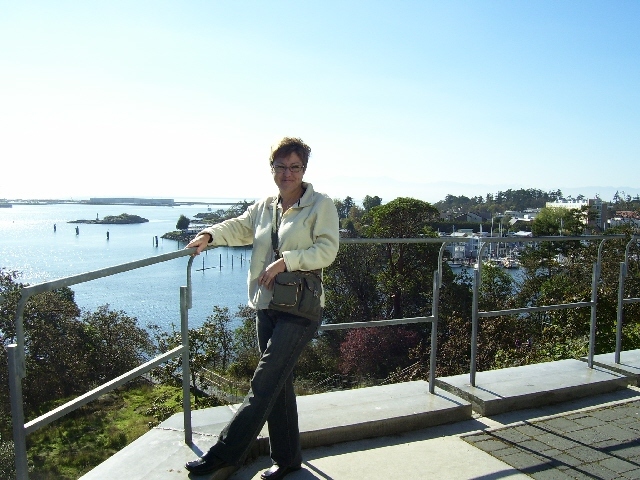 And this is me, my dad's older sister lives in an apartment close by and this walkway goes all the way down to the shoreline, this is part of Victoria Harbour where the Cruise ships come in. Since my return from the trip I lost a week of creativity for my shows I have been busy this week making bookmarks, corner bookmarks, more inchie Christmas houses for tree ornaments, next I am doing an idea I got from ARTCHIX studio and I cut out some wooden shaped houses and I am in the process of decorating them with mixed media. That reminds me, Jackie at the warehouse for Artchix Studio I have been in touch with for an order. I was going to pick it up there while I was in Victoria but because of my appts and schedule I had only 1 day to pick up and Jackie was so nice, she will ill and was going to make a special trip back to the Warehouse but she was willing to drop my order off for me at my hotel. So Jackie this is a huge cyber thank you for doing that for me and I sure hope you are feeling better. Well that being said I had better hit the kitchen studio again and keep going. Time ticks away, lunch runs into dinner time which runs into evening then bedtime at 11. The workshop closes every night at 11pm no matter what I am in the middle of. Lesley, your Dad is looking handsome and very loved thanks so much for posting a update for your art fans. Praying for you and your family.